But a few of the names I came up with for these yahoos while walking them today. 1.25 hours in the park. 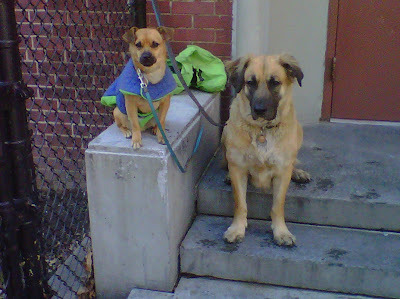 2+ hours on leash walking to run an errand over in Park Slope. One of them is tired and won't be getting riled up again tonight. OK, you try. Who do they look like to you? Biggie and Tupac. That's the one. Spike the Bulldog and Chester the Terrier!